Happy spring break for those of you (a) in academia and (b) on the same break schedule as I am. This is probably my favorite Brown Sharpie ever. And of of about six that I think I actually understand. Steve: glad to hear it. I’m going to assume you know that “Gödel” is pronounced a lot like “girdle” (which is, in my opinion, why this is funny!). But if there’s anything I’ve learned about my audience, it’s that they and I have different senses of humor. Sigh. 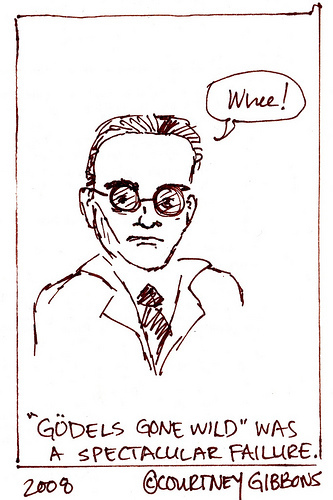 anyway, Gödel is a german name so his correct pronounciation is much more like goh-dell than girdle. but it´s pretty hard to describe what the ‘ö’ should sound like….if you know the champagne label moet-chandon that the ‘oe’ in there is pretty close.